I was browsing through a Lowcountry cookbook of mine, Shrimp, Collards, & Grits, when I came across a recipe for Corn Pone in the Gullah section. 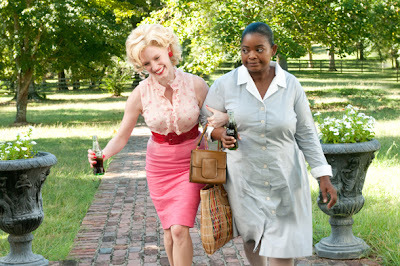 So, in honor of my favorite character in the book/movie The Help, Miss Celia Foote, I thought I'd give it a try. In the book/movie, if you remember, Corn Pone was pretty much the only dish she could make. Anyway, I went forth with high hopes. How bad could it be, right? It was not good. It wasn't terrible, but it wasn't good. The texture--interesting? And that's putting it nicely. So, this is a weird Tasty Tuesday, since I made something that I'm encouraging you NOT to attempt. But, here is the recipe for you brave souls out there. See? I couldn't even make the photo look appetizing! Dump all in a bowl and mix and dump in a baking dish big enough ta hold. Bake until done, 30 minutes. In all honesty, it wasn't that bad. We kind of liked it the more we tried it. The first few bites were tough to get through with the weird texture and all. I won't make it again, but you might like to give it a try. You never know, one girl's "gross" might be another's "yummy". I loved her character in the movie too! Your corn pone recipe looks like corn pudding to me but yours looks way too dry! No wonder you didn't like it. That's not how real corn pudding looks. Hate to break it to ya. Corn pine is kinda like a corn fritter or biscuit. What you have there in your recipe is not corn pine. I was raised in the south and can tell ya that for sure. You also make corn pine with an iron skillet. One more thing...canned corn is no substitute for fresh cut corn but frozen is a lot closer. Not being mean ok. Just trying to help you along. we are throwing a "the help" theme 50th birthday party for a sorority sister and corn pones are on the menu in honor of Celia! go check out my blog: www.itshotinthiskitchen.com! Love your blog - by the way, my corn pones are different - the ones my grandmother used to make - fried little crispy corn cakes. for the party, we are dressing them up with a little dipping sauce!